Since ASPEN's first release at NAB 2015, many leading broadcasters and equipment manufacturers are realizing the benefits of the ASPEN protocol for their leading edge IP facilities and products. Developed to meet the real world requirements of an IP-centric facility while leveraging proven MPEG2-TS standards, ASPEN offers a robust format for encapsulating uncompressed Ultra HD/3G/HD/SD over MPEG-2 transport streams (TS). The development of ASPEN has been a collaborative effort of Evertz and many broadcast industry leaders. 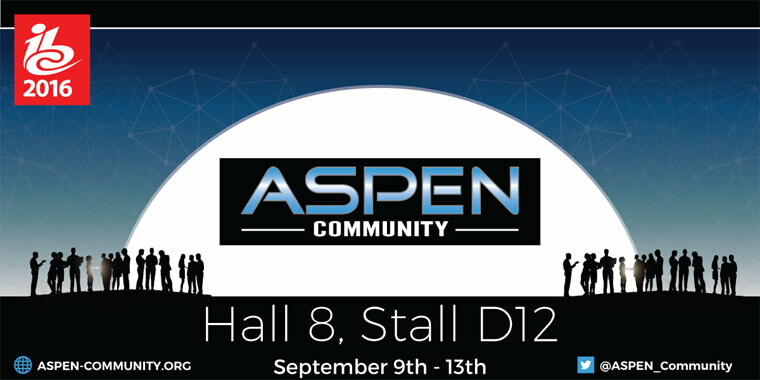 Evertz will be participating in the ASPEN Community Booth at IBC2016. Be sure to stop by for a visit. Current members of the ASPEN Community include: Abekas, AJA Video Systems, AMV, Broadcast Pix, ChryonHego, Cinegy, Comprehensive Technical Group (CTG), CSP Inc., Deltacast, Discovery Communications, Diversified Systems, Dome Productions, Edit Share, Embrionix, Evertz, FOR-A, FSUE "TTC" Ostankino", Game Creek Video, Guitammer, Hitachi Kokusai Electric Limited Inc., I-MOVIX, Ikegami, LEADER Electronics Corp., LiveU, Macnica America Inc., Matrox Electronic Systems Ltd., Media 5, NBC Sports Group, NEP Group Inc., Neutrik, NewTek, Nextera, PacketStorm, Phabrix, Pixel Power, Providius Corp, Rohde & Schwarz, Ross Video, SolidState Logic, Sony, Streampunk Media, Tektronix, The Weather Channel, Time Warner Cable SportsNet, TV2, TVU, Velocity Broadcast, and Vizrt. © Evertz. All rights reserved.